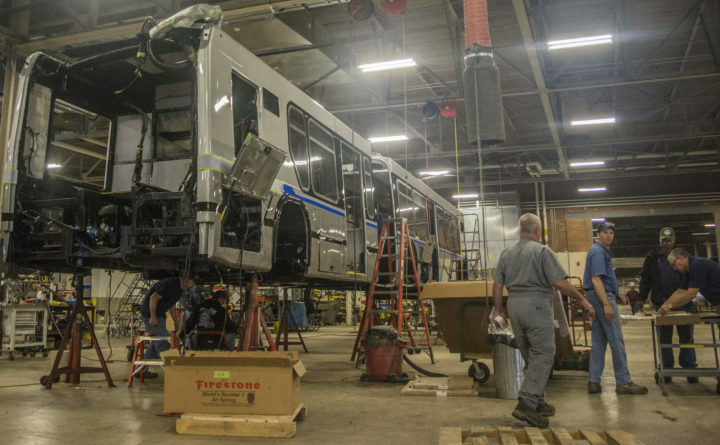 Maine Military Authority employees work on reassembling a Massachusetts Bay Transportation Authority bus for an overhaul intended to extend the vehicle’s lifespan. This bus is one of several large vehicle overhaul projects handled by both MMA and Loring Industries, a newly formed LLC that, in addition to providing truck parts on the former base, assists with disassembly, paint prep, and a variety of other overhaul-related tasks. Local officials hope that a new “Opportunity Zone” designation that offers tax breaks on investments will help attract more business to the base and the region. LIMESTONE, Maine — When the Maine Military Authority completes its Massachusetts Bay Transit Authority bus renovation project in a few weeks roughly 50 employees may be out of work. The project began in 2014, when MMA signed a $19 million contract to overhaul 32 transit buses. Officials determined in 2016 that the project was more costly than initially anticipated, but Gov. Paul LePage and state lawmakers ultimately saved the contract and jobs by approving a $7 million rescue package. In addition, the newly formed Loring Industries LLC on the former Loring Air Force base entered into an agreement with MMA to supply some of the specialized parts required to complete the bus contract. The Bangor Daily News is pleased to feature content from our sister website, The County. To read the rest of “MMA may lay off up to 50 employees after bus renovation project,” an article by The County/Fiddlehead Focus staff writer Christopher Bouchard, please follow this link to The County online.